Here's Gail Gygax's latest Facebook post. She specifically asked for it to be shared, so in the interest of fairness, I'm sharing it. So, why is Tim asking questions? Why are his questions "personal attacks"? Aren't there some records that are supposed to be made public by non-profits under Wisconsin law? There have been no updates on the fund's site (except for the removal of the names of gaming personalities that were listed as being associated with the Fund. Those that I had spoken with had no idea they were being linked to the Fund). There have been no answers. Today is the first update on Facebook since the community submitted questions via The Tavern for Gail to answer back in November. I strongly suspect without Tim's posting yesterday, we wouldn't have today's update. Whatever reasons Tim had for asking his questions, it resulted in the only Gygax Memorial Fund news in the last 6 months. 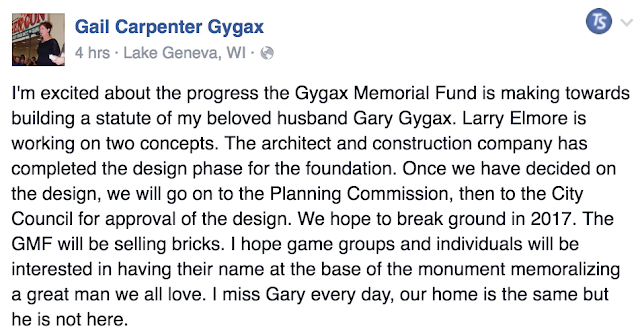 I think that the issue here is that many in the gaming community would actually like to donate the the Gygax Memorial Fund, but when they get to the website and see the last piece of news is from 2014, they get the feeling that it's going nowhere. I could be wrong, but when I see the last piece of news is from December, 2014 and there are no other updates except for today's Facebook posting, it's not a sign that instill's confidence in my eyes. I believe the gaming community wants this monument and they want to believe it will get done. Give them more than words, give them actual progress reports. Show them what is happening, don't just tell them in a Facebook posting. 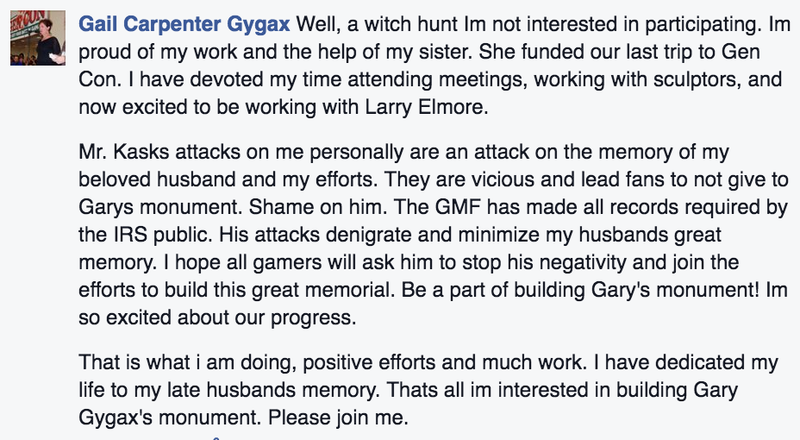 Gamers might play a game of make believe, but they need evidence to believe in Gary's monument. Give them the evidence for them to believe. 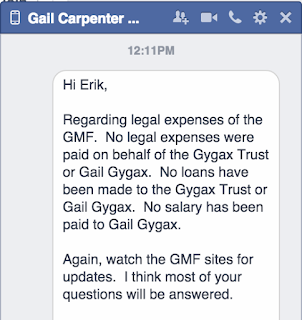 Note: Comments about the Gygax Revocable Trust, the Gygax trademark and the like will be deleted. 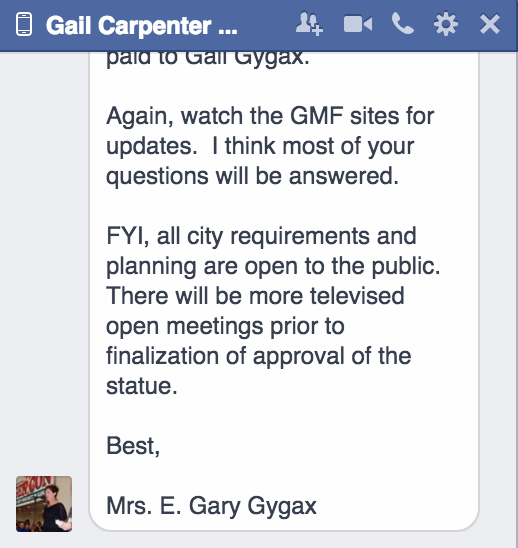 This is simply about the Gygax Memorial Fund. I am generally an extremely light moderator, but lets keep this focused. Best case scenario appears to be incompetence. Worst case scenario is fraud. They already have enough money to build a memorial in either case. I thought his memorial was millions of copies of books sold, millions of people playing his game, and his name becoming an adjective. IF the website was updated with current news I would donate. But the FAQ sections along with others are not completed just coming soon. That shows me that it is not going anywhere at all and hasn't been for the past two years. 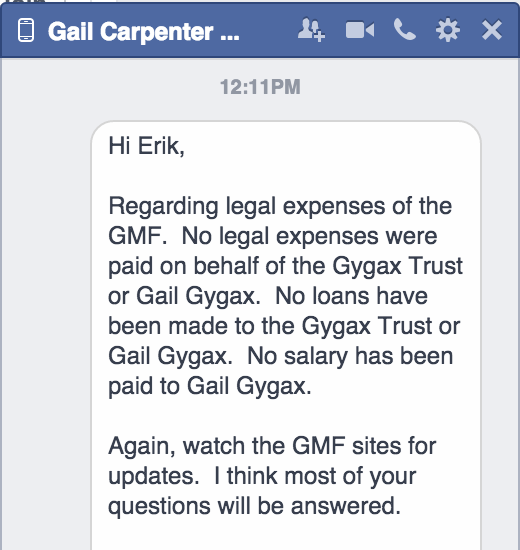 "Note: Comments about the Gygax Revocable Trust, the Gygax trademark and the like will be deleted. 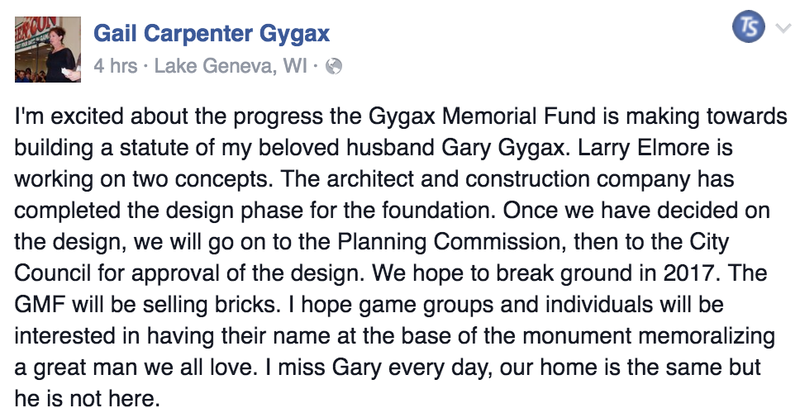 This is simply about the Gygax Memorial Fund. I am generally an extremely light moderator, but lets keep this focused." Still scared of the lawyers, huh? No, but people mix the 2 around almost interchangeably, and I want to keep this on topic and focused. Yes, unusual for The Tavern but we'll give it a try. The problem, as I see it, is a general lack of substantive communication of pertinent information, i.e. no real news. This "update" doesn't give any real information and the lack of other updates creates a vacuum, a void that just begs for the questions that have been made by Tim Kask. I do not understand the implication made that these questions constitute a personal attack, just a series of logical questions that stem from what little information is available. If someone in the position of managing a sum of donations is unable or unwilling to face even a modest amount of scrutiny then there are obvious larger implications, factors that put the original project into a questionable status at best, and at worst, definitely not something the community at large should be supporting into the future. "That would clear the way for work to get started by spring 2015. " It's New Age thinking: A non-answer is better than no answer. Old Age thinking was that non-answers and no answer were one and the same. 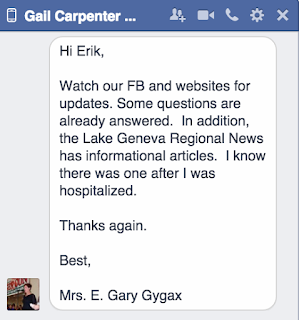 Tim's "attacks" on Gail are not an "attack" on Gary. Get over it, Gail. Having worked in construction since I was nine -- my father took me to work with him during the summer and on holiday breaks -- and having entered full time at 17, I must ask: How many years -- or eons -- does it take to DESIGN a FOUNDATION, of all things? The question is rhetorical, of course. It sounds like she may be deluding herself about what she can accomplish. She's had some apparently bad health issues. It wouldn't surprise me if she has every intention to fulfill the fund's goals, but is simply incapable of it due to age or infirmity. It is sometimes very hard for someone to admit they are in over their head. Good intentions sadly don't buy squat. My money is staying in my pocket until someone competent takes over. I would gladly donate to a competing fund if one existed. Maybe it would be a good idea to check with Larry since his name was dropped. It's also not hard, since it is public record, for someone in the LG area to check the records and/or make a FOIA request on the project. Six figures worth of money invested and nothing to show for it, and any questions about the issue are met with either "we're still working on it" or "it's a witch hunt." Why does this all sound so familiar? This is like Ken Whitman all over again. 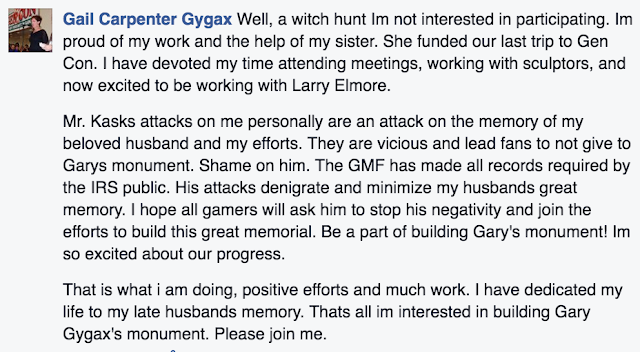 The attempt to characterize the questioning of the fund's handling as an attack on the memory of Mr. Gygax eliminates any interest I had in supporting this. I hope it gets built, but at this point the entire effort has a very different feel from what I imagined when I first heard of it. Now throwing Larry Elmore's name around for the Ken Whitman trifecta! The tax records are published on the website, as is required law. Looks like they have received a total of just over $244k in donations between 2011 and the end of 2014 (the 2015 records are not yet posted), and spent less than $25k of that, leaving just about $220k in the account. Doesn't sound like fraud to me.